I don't usually compose a long form response to news stories, but this issue isn't going away and the controversy appears only to be escalating. I might lose some "friends" over these statements, but they are long considered and carefully-chosen. Republicans are all-too-eager to accuse Representative Ilhan Omar and others of "Antisemitism" when they criticize the Israeli government (and Israeli influence-peddlers like AIPAC). Republicans do so for nakedly partisan reasons. And yet the knee-jerk response among establishment Democrats to condemn or sanction Omar only plays into these utterly disingenuous GOP tactics. This controversy reveals a deepening divide in American attitudes about Israel's policies and influence in the USA more generally... but is currently playing out almost exclusively between establishment/centrist and insurgent/progressive Democrats. We must give ourselves a brief reminder: many of these same Republicans, Donald Trump included, have their own documented history of actual Antisemitism - jokes about Jewish money and deal-making, an ominous negative ad against Hillary Clinton with the Star of David next to her head, anti-immigrant "infestation" sentiments and internment camp policies harmful to those fleeing genocide and persecution, and a drumbeat of accusations of some "globalist takeover" associated with prominent Jewish political and philanthropic leaders. The political right is routinely lax in condemning these actions because their base enthusiastically embraces them. Recall that almost all documented cases of Antisemitic domestic terrorism dating back decades have been unmistakably right-wing attacks, such as last year's shooting at the Tree of Life synagogue. It was at the Unite the Right rally in Charlottesville, replete with MAGA hats and Confederate flags, that we saw young Caucasian men chanting "blood and soil" (Nazi Germany origins: "Blut und Boden") and "Jews will not replace us." If we are really concerned about Antisemitism, we should be laser-focused on the right-wing white supremacy movement and their de-facto Apologist in Chief who sees "very fine people" among them. For these reasons, Ilhan Omar is merely a convenient political pariah because, you know, she's a Muslim woman of color and thus surely her criticisms must be coming from a place of Antisemitism. 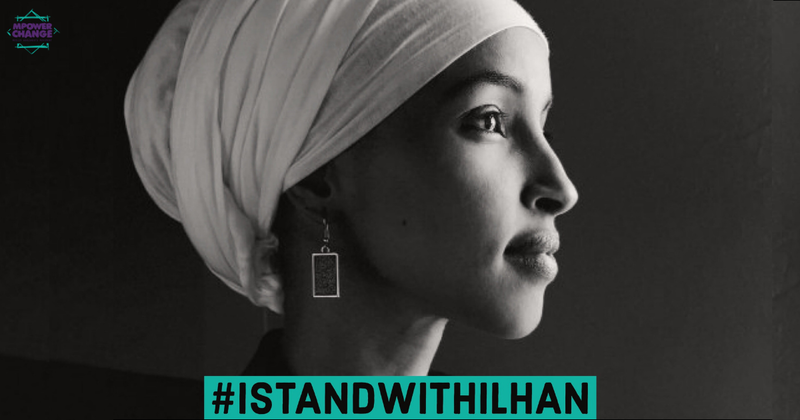 Much of this hand-wringing among conservatives about Omar's purported "Antisemitism" is mere proxy for their underlying anxieties about Muslim immigrants and leaders of Islamic faith ascending to positions of political influence within the United States - even via free and fair elections. Triangulating their hatred of Muslims off an ancillary concern about the well-being of Jews is a deeply disingenuous right-wing political maneuver. The Democratic party is falling for it. Last weekend, Omar was herself targeted by a West Virginia GOP organization for being in office only because Americans have "forgotten" about 9/11. She regularly receives death threats for being one of the first Muslim women in Congress and the first Representative to wear a hijab. Islamophobia and hatred towards Muslims is quite casually and continuously meted out in the USA and has been for decades. Omar is the most prominent recipient, but hardly the first. And yet Omar has been called to task, over and over and from sanctimonious elements within her own party, for asserting the broadly-held and altogether reasonable views that: 1) the foreign nation of Israel exerts far too much influence on US policy and policy-makers and 2) the boundaries of political debate about Israel's own human rights record have been far too restrictive and with far too high a body count. Omar has repeatedly apologized for any statements which might be interpreted as Antisemitism and has shown a sincere willingness to listen to Jewish voices on this issue. But these apologies have been met only with further condemnation and calls for her to resign and/or be stripped of her committee assignments. Her critics will not be appeased by thoughtful remarks or an open dialog; they demand her censure and ultimately her silence. We should not abide. In any case, it has become patently absurd to equivocate any and all criticism of: the Israeli occupation and its Apartheid-like treatment of the Palestinian people, Netanyahu's rampant trail of corruption, and the Israeli government's influence in both US domestic and foreign policy... as carte-blanche license to condemn said criticism as "Antisemitism." Those aren't prejudicial statements against Jews as an ethnic or religious community; those are criticisms of Israel as a collective body politic. This is largely a problem of Israel's own making; to the extent any government ties its origins, claims of legitimacy, and political structure to an ethnic or religious identity, warranted criticisms of such a government become almost inexorably entangled in these same protected categories. To criticize a "Jewish state" is tantamount to criticizing both the political entity and also its religious and ethnic foundations. Thus the problem of ineffability here is the entirely predictable ramification of a quasi-theocracy masquerading as a secular state - expecting the privileges of both and the criticisms of neither. Israel cannot have it both ways. If we are conversationally capable of criticizing the political corruption, human rights abuses, and undue influence of Saudi Arabia without accusations of (and resolutions against) "Islamophobia," surely we can apply the same set of standards to criticism of the Israeli government, Israeli political leaders, lobbyists and other influence groups. Israel and Saudi Arabia are not analogous in every sense, but the vastly disparate degree to which contemporary criticism of each is tolerated has become instructive and striking. Lastly, it seems awfully convenient that the litany of "harmful Antisemitic tropes" applied to any critical speech of Israel are largely the same matters that are actually at issue here: outside monetary influence in political affairs, secretive internal alliances that are undisclosed yet affect public policy, and the misleading use of invocations of real historical grievances to shore up support for otherwise barbaric human rights violations. It appears that the very real criticisms of Israeli influence are bound up in the language of "negative stereotypes about Jews" which, whether calculated or unintentional, make genuine and founded criticism virtually impossible to achieve absent charges of "Antisemitism." We must be willing to support the many legitimate criticisms of the Israeli government and those who make them. We now have a new generation of political leaders within the Democratic Party - and doubtless with more to come. We cannot feign to embrace their diversity of experience, background and viewpoints as mere tokenism for demographic convenience... to be seen and not heard; that's what Republicans do (Mark Meadows and Donald Trump's "black friend" comes immediately to mind). If Americans champion elected officials who are willing to challenge political norms and established alliances - particularly those replete with corruption and human rights abuses, we must also be willing to stand behind them for these same positions rather than engage in venal friendly fire and pearl-clutching posturing. It will be to the detriment of Americans everywhere if dissenting views (especially popularly-supported ones) are disallowed by emerging political leaders with a mandate to reject business as usual in Washington's power centers. That such dis-allowance of debate is framed in the service of religious and ethnic diversity is even more objectionable.